We all seem to find things about ours bodies that we do not like. Many of us know the unhappiness and self-loathing that a poor body image can cause for ourselves. But, how do you know, when you, your friend or loved one has veered into a danger zone? How do you know when it is time to be concerned about his or her negative body image, low self-esteem or disordered eating behaviors? And, once you have decided that you need to do something to help this person, what do you do? All of these questions are difficult to ask or think about. , And they are scary. But, knowing that your friend or loved one is hurting and that his or her body image, self-esteem and eating habits are not healthy is emotionally and spiritually overwhelming. Below, I list some general signs of a person who is struggling with body image, self-esteem or eating problem as well as some of the best things that you can do to help that person. What to take note of…. Poor Body Image. Notice if the person often engages in negative self-talk such as “I’m so fat” or “I have no self-control.” Notice if the person consistently interprets others’ comments as negative judgments of him or herself. Negative or obsessive thoughts about body size and body insecurity are important signs to look for. Wanting to Eat Alone. 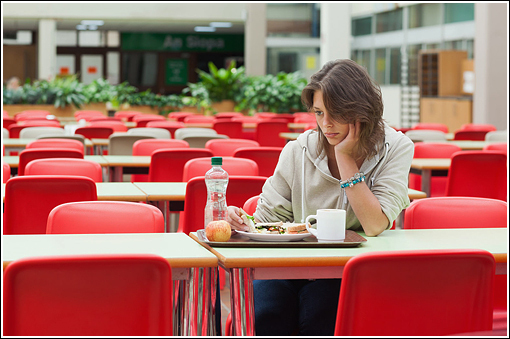 If your friend or loved one has a fear of eating in public, it is important for you and for them to question why this fear exists. Is the person self-conscious about food intake in relation to his or her body? What is underlying the person’s anxiety? For people struggling with disordered eating, food in and of itself can provoke anxiety, so eating in public is even more anxiety provoking than eating alone. Excessive exercise. This one is difficult because defining what ‘excessive’ is can be tricky, especially when talking about active adolescents and athletes. The key questions to ask yourself are: Does my friend or loved one panic if he or she misses a day of exercise? And, will he or she exercise even when sick or injured? Exercise can be a compensatory behavior in response to food, so noticing the role that it plays in your friend or loved one’s life is important. Eating Rituals. Does your friend or loved one approach every meal in a regimented way? Does he or she cut food into very small pieces? Arrange items on a plate in a certain pattern? Always leave the same item uneaten? Eating rituals can indicate attempts to eat less as well as obsessive food related behaviors. Feeling Cold and Fine Body Hair. Feeling cold is often a symptom of low body fat and malnutrition. Choosing to wear heavy sweaters on warm days and always wanting to keep a jacket on inside the house are common indicators that a person’s body is having difficulty maintaining warmth. Additionally, people who are restricting their caloric intake often develop a thin film of hair that is soft and downy on his or her arms and other parts of the body. This hair is known as lanugo and emerges after extended periods of malnutrition. Trust Your Gut. If you are concerned, listen to yourself. You might not have clarity on what exactly feels unhealthy about your friend or loved one, but if you are worried, do not ignore that feeling. Educate Yourself. Learn as much as you can. Read books, articles, and brochures. Try your best to distinguish facts about your friend’s disordered eating with inaccurate ideas that he or she has. You can learn more at the National Eating Disorder Association (NEDA) website. Be Honest, Caring, and Firm. The best thing that you can do for your friend or loved one is to talk openly with him or her about your worries. Your sharing your concerns indicates how much you care for him or her. You do not need to police the person or try to take responsibility for his or her actions. Instead, compliment the person’s personality, accomplishments and successes while also expressing to him or her what you have observed and why you are worried. Seek Help. No one can force someone else to change his or her attitudes and behaviors or to engage in help. Once you have openly and honestly shared your concerns with your friend or loved one, tell someone else. Ask others in this person’s life to support you and this person in taking the problem seriously and addressing it. If you can, seek the help of a professional who has experience working with others with negative body image and self-esteem. Asking the professional to speak to your friend about your concerns might help the person to take your worries more seriously. Many people worry about having a fall-out in their relationships and avoid confronting their friends and family about eating habits concerns. While this is always a risk, your loved one’s long term health is the priority; you and he/she can begin to repair the relationship once he/she is healthy again. These symptoms can arise for any number of reasons including (but not limited to) depression, anxiety, bullying, trauma, and/or unhealthy relationships. Whether you are the person struggling with a body image, self-esteem or disordered eating problem or you know someone who is, support and help are available. Recovery is possible. . Please feel free to contact me with questions about yourself or others at any time.